Duncan Kitchin is an amateur astronomer in Oregon. Like many of us, he has a telescope that’s kind of a pain lugging outside (my old ‘scope was the same size and shape as a water heater, leading to much hilarity as it sat in the living room). Duncan got tired of dragging it out when it was clear, then hauling back inside when the observing was done. 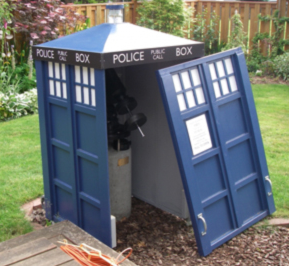 Well, if you’re an astronomer and a Doctor Who fan, the solution is obvious: pour a concrete pad, install the permanent mount for the ‘scope, and then make yourself a protective shell around the whole thing… shaped like the TARDIS!